Unai Emery says he was happy with midfielder Aaron Ramsey's performance as Arsenal reached the quarter-finals of the Carabao Cup with a 2-1 victory over Blackpool at the Emirates Stadium. Sky Sports News understands that the Wales international, who played the full 90 minutes at the Emirates Stadium on Wednesday evening, will leave the Gunners for free at the end of the season after being told why he will not be offered a new contract following a breakdown in negotiations. When quizzed on Ramsey's future, Emery remained coy, saying he was pleased with his performance and his focus against Blackpool. "For me, he worked very well," Emery told Sky Sports. "I spoke with him last week and I want his focus with us. "I am very happy with his performance, with his work and on the whole he helped us." When asked about Ramsey's contract situation again, he added: "For me it's on the pitch. Each training, each match like today." Meanwhile, Emery thought his side deserved to reach the Carabao Cup quarter-finals following their win against Blackpool. The Gunners had appeared to be coasting into the last eight as Stephan Lichtsteiner's first goal for the club and a second-half strike for Emile Smith Rowe put them in charge. Blackpool rallied after Matteo Guendouzi was dismissed for a second yellow card and O'Connor headed the visitors back into the contest. But the Gunners, who picked up a 12th win from the previous 13 games in all competitions, held on to book a quarter-final showdown with north London rivals Tottenham. 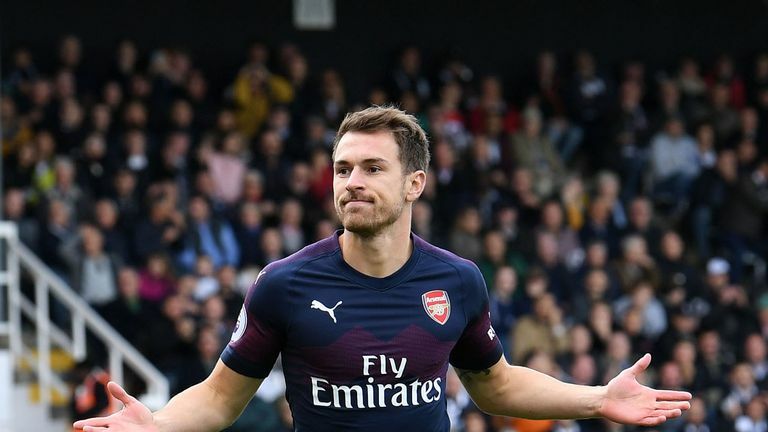 Should Aaron Ramsey move to Liverpool? Steve McMahon urged his former side to look at signing the Arsenal midfielder on The Debate. "A lot of things happened in the game in the 90 minutes but I think we controlled a lot of moments in the match," Emery said of his side's display. "This red card to Matteo affected the balance more for them and their goal also, we can and we need to continue our work to the last minute with our performance and our players to win today. But I think that doing our work, we deserved this victory also."